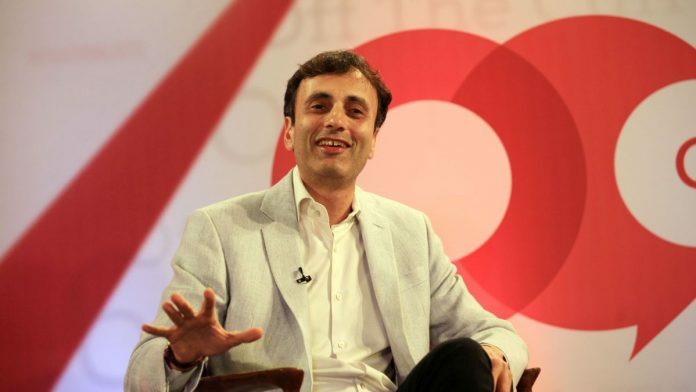 Investment guru and political observer Ruchir Sharma said free market proponents like him are disappointed with Modi’s 5 years at the helm. Mumbai: The political narrative ahead of the Lok Sabha polls seems to be revolving around Hindutva, but it is a very north Indian, Hindi-heartland discourse that does not necessarily echo with the rest of the country, according to Ruchir Sharma, author of the newly-published book Democracy on the Road. Sharma, head of emerging markets and chief global strategist at Morgan Stanley Investment Management, was speaking to ThePrint’s Editor-in-Chief Shekhar Gupta at Off The Cuff in Mumbai. The investment guru said most people in his circle are labelled ‘liberals’ but are right-of-centre when it comes to economic policies, believing in free markets, minimum government and maximum governance. And from that perspective, he is disappointed with Narendra Modi’s five years in power. “The one thing that I caution about this election is that the discourse is a very Hindi heartland-dominated discourse, and the rest of the country is very different,” said Sharma, whose new book focuses on how India and democracy works at the grassroots, based on his experience of traveling through India chasing election campaigns for over two decades. Not only is the Hindutva narrative restricted to the north, it is also a very “upper-class” discourse, and Dalits and some other communities within the Hindu religion do not identify with it, Sharma said. The narrative, he said, does not work in southern India either, barring a few pockets such as north Karnataka, and added that the “exclusion” of this region is one of the most under-reported stories this election. Sharma, who has also authored bestsellers such as Breakout Nations and The Rise and Fall of Nations, also said that the recent polls in Madhya Pradesh, Chhattisgarh and Rajasthan, in which the Congress defeated the incumbent BJP, may not tell us anything about how the country will vote in the Lok Sabha polls. “Historical data says that the way one election goes, another election within six to 12 months follows the same trend at least in that particular state. But India is so complex that how some states vote tells you nothing about the rest of the country,” Sharma said, adding that the 2003-04 period is very instructive in this regard. He pointed out that Atal Bihari Vajpayee’s BJP-led government was emboldened to call an early election in 2004, buoyed by its victory in these few states, and while the party did well in these states in the general election it still lost in the rest of the country. Sharma also said caste still plays a major role when it comes to the polls. “My own learning is that this election is not so much about issues as it is about caste again. You ask people what they think about demonetisation, the Goods and Services Tax, their answer is still in caste,” he said. He added that the Lok Sabha poll is a “truly open election, and there is no way at this stage for anyone to say what’s going to happen”. “We have to wait and watch closer to the date, but it will be a game of coalitions,” Sharma said. Previous articleForty years on from the Iranian Revolution, could the country be at risk of another one? Obviously,this Sharma has not heard of Karnataka in South India.In the present assembly BJP has 104 seats,Congress just 78 and JD(S) a measly 37.It is Hindutva all the way.In the last LS election BJP got 16 out of 26. Modi has exposed himself as a dull and average leader, and even more mediocre reformer . He is NOT bold and his insecurity is now palpable. His demonetisation could become one of the finest examples of bounded rationality. However, he or any other leader who emerges from the democratic intra-party elections is still a better choice for a young democracy than a scion born with a dynastic silver spoon in the mouth. The coming GE will really test whether India is ready to become a mature democracy or still prefers the cosy embrace of dynastic rule that itself needs multiple crutches to survive. The simple fact is that this world view resonates with very few Indians. See how swiftly the Ram Mandir issue has been wound up. Or how badly the CAB has played out in the north east. 2014 was not at all about religion, language, diet, all the other fads that are being imposed by edict. It was about good governance and economic development. 2019 will be a referendum on how much and how well these have been delivered.